A late March blizzard has finished blowing over much of Canada’s Northwest Territories and Ron Near’s job just got more interesting. 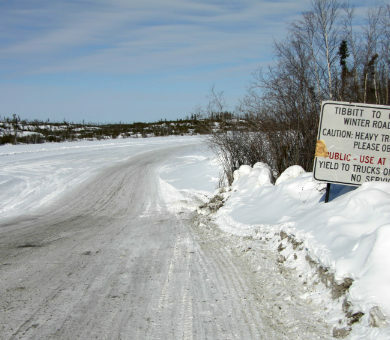 A retired Royal Canadian Mounted Police officer, Near is in charge of the world’s longest ice road that connects Yellowknife, the territorial capital, to three diamond mines: Ekati, Diavik and Snap Lake. Joelie Sanguya raised his axe, paused for a moment, then with a swift blow swung it at the frozen seal carcass. Behind him a chorus of hungry sled dogs filled the arctic air with a cacophony of excited howling and barking in anticipation of a well-deserved dinner. CLYDE RIVER – Joelie Sanguya raised his axe, paused for a moment, then with a swift blow swung it at the frozen seal carcass. Sanguya, an Inuit hunter, artist, filmmaker and an expert musher, continued to work his axe on the frozen carcass, removing the head. Then, bracing the seal body with a hook, he used a butcher’s knife to cut through the skin and into the blubber. He was methodical, cutting chunks that looked like oversized cubes, and tossing them aside. “Don’t step in that. It’ll stick to your boots and stink up the tent when it warms up. “I’ll leave the skin and the blubber for crows and Arctic foxes – dogs only eat the blubber when they’re really desperate,” he explained, returning to his axe to hack at the skinned animal. Dark maroon in colour, the frozen seal meat shattered like pieces of broken pottery with each blow.